Those colours look so great on you! 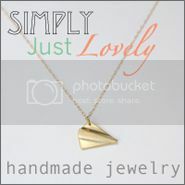 I'm going to check out Loren Hope's jewelry - it's so beautiful! these two colours on you are beautiful! very summery and fresh! i love those colors together!! and I love how you rolled your pants too - so cute! 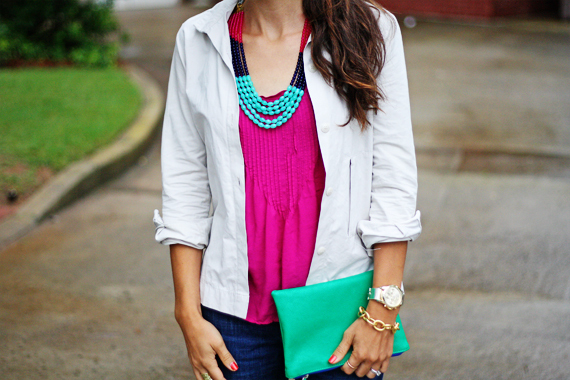 Love the combination of colors and the necklace is beautiful! Gorgeous!!!! I love the colors!!! You look great. I'm obsessed with those shoes! I really love all the colors you have going on. It's so fun but still chic and put together. this is so pretty. the cuffed jeans look great with the shoes and i really really like the bag! You look great in those colors! :) Happy Monday! Total BABE! :) You look stunning! Pink and green is color combination I never tire of and it looks great on you! The weekend always seems to go by so fast but I did see an amazing Chanel exhibit. Happy Monday Anna! You look beautiful Anna! I love the color and those wedges are perfect. I hope everything has been well with you and you are off to a great summer so far! I hope you had a great weekend and have a wonderful Monday. 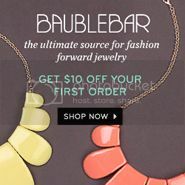 Loving all these bright colors!! That color is great and I really like the shoes. You always hit it right on girl. LOVING this color combo! Love the combo! And, I had not heard of Loren Hope. Must check it out. This look is so great! 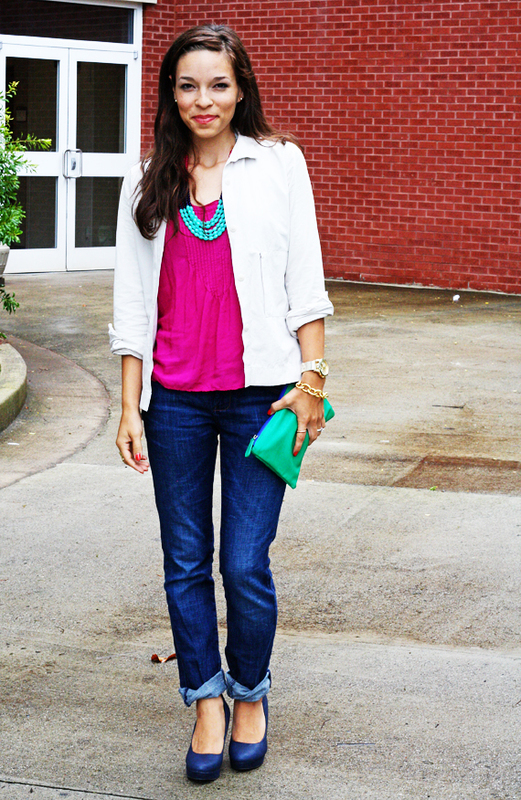 Love the color combinations and the cuffed jeans totally sealed the deal for me! Oh wow great necklace! I love Loren Hope's jewelry. I have a few earrings and I always get tons of compliments on them! Such a cute look! 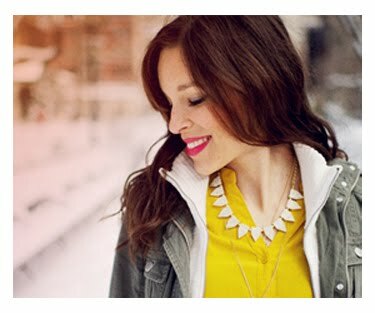 Loving the color of your top and your necklace! 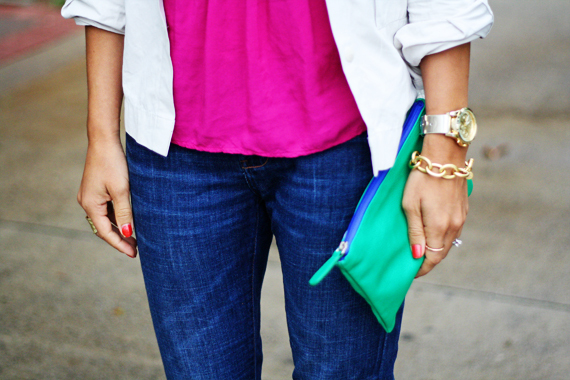 I'm obsessed with mixing hot pink and turquoise, love! Totally in love with this color combination. Looking gorgeous, as usual! I love how the pink pairs with the bright shades of green--this is a color combination I need to rock soon! 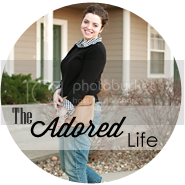 I absolutely love the pattern mix and I loved your guest post on rockstar diaries! love everything especially the jeans! Love the colors Anna, very cute! I love how you rolled up your jeans. So effortless! great colors. the Loren Hope accessories are so lovely. Love the fuscia top and cobalt heels! The white blazer brings a crisp, finished look to that outfit! I can't get enough of those colors! Love these colors, they look great on you. I saw this on reader and facebook yesterday and though damn you are one cute and hot mama! I love the colour combination! So summery! So fresh and lovely—these colors are naturally perfect together, but I adore the way you have paired them and rolled your jeans—very chic! What gorgeous colors! I think anyone would feel cheerful wearing them.